We provide easy to read car histoty report with government official ppsr certificate instantly. What Does the Quick PPSR Vin Check Offers? When buying a car, it is important to know the history of the car. Do the registration details match the car on offer? Does the car have any significant defect or is it stolen? These are some of the questions you can have answered before buying a used car. Getting a VIN check is one way to obtain information about a car’s history prior to purchase. At Quick PPSR, we offer VIN checks at affordable prices. Our VIN check Australia service is available to car owners and prospective car owners in different Australian states such as Western Australia, New South Wales to Queensland. Get to know if the vehicle has any monrey owing, Our Vin Check report identifies the vehicle your are going to buy weather currntly on finance or not. If the used car you like was in an accident, we’ll find out. Our reports show whether the vehicle was in an accident and if it had repairable write-offs, the accident resulted in a total loss, or if there was no accident history on that car. The stolen vehicle section on your Vin Check Report lets you know if the vehicle was reported as stolen but not recovered. This ensures that you don’t end up buying stolen property and the problems that this can cause later on. No Matter if you search for “Vin Check NSW”, “Vin Check QLD”, or “VIn Check WA”, our report will give you details online about vehicles throughout Australia. So, get your Vin check done online here. Why Choose Our Vin Check Report? We are the comprehensive resource for car history information on used cars in Australia. We have simplified the process to help you get relevant details from different government bodies about any second-hand car that you would like to buy. we want you to enjoy the most affordable rates to make conducting a VIN check easier for you. Official data from the government NEVDIS and PPSR registers for reliable Vin Check results. Our Vin Check reports give you info on finance owing, write-offs, thefts, PPSR Certificate. Pay online safely for your Vin Number Check report through our secure payment processing platform. A VIN number is a unique 17-character code that identifies a given vehicle. Before conducting a VIN number check, you have to obtain the car’s Vehicle Identification Number from the inside panel of the front driver’s side door or from the bottom corner of the driver’s side windshield. If you are not in possession of the vehicle, simply ask the dealer to send you the insurance policy and the VIN number should be listed on the title and registration. Who needs a VIN Check? A Vin Check is similar to Revs Check, it is a convenient report that allows both buyers and sellers to secure their interests. As a buyer, a VIN number check will help you find out the detailed history of a vehicle you want to own. Knowing the registration, financial and other details on your car will help you make a decision on whether to buy it. As a car dealer, securing a VIN check report would add credibility to your asking price. 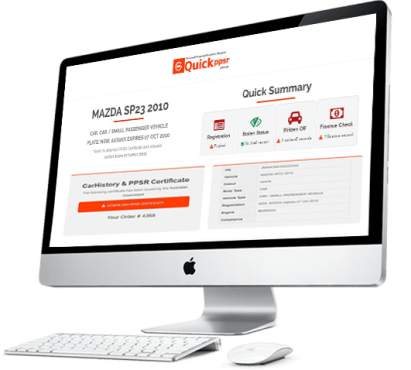 The Quick PPSR easy-to-use and very affordable VIN check can be used to look up vehicles in all Australian states and keep you from buying something that is not worth your while. It is a fast and easy way to check on the quality of the car that you want to buy. Whether you want to upgrade your car or are buying one for the first time, our VIN check Australia can help you make the right decision. "Used quick ppsr on the way to buying the car, they provided me with the details i needed instantly"
"It was the easiest & cheapest thing I had to do before committing to a purchase of a car. Thumbs Up..."
"Quick & easy & way cheaper than the other websites......cheers"
"Better than expected. Excellent value for money. Why pay more for similar services." "Perfect company never better than you guy, I'm very strong to recommend or refer you to my relative, friends and others."